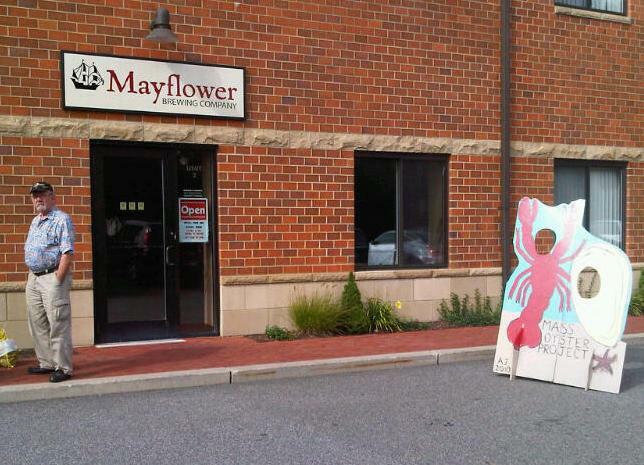 On Sunday October 7th from 2:00-6;00 pm MOP and Mayflower Brewery will be hosting the second annual oyster and beer tasting.Mayflower Brewing Company is a craft beer microbrewery located in historic Plymouth, Massachusetts. Founded in 2007 by a tenth great grandson of John Alden, beer barrel cooper on board the Mayflower, they are dedicated to celebrating the history and legacy of the Pilgrims by creating unique, high-quality ales for the New England market. The Brewery will be showcasing their new Autumn Wheat Ale. This dark wheat beer combines the fruity aroma and bready character of traditional wheat beers with the malty richness of dark ales. The result is a flavorful and medium-bodied beer that is just right for the crisp days of autumn. 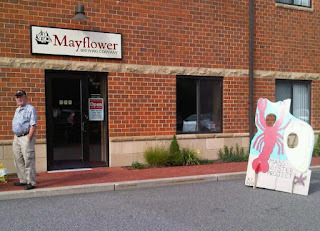 MOP and Mayflower Brewing Company in Plymouth, MA team up again for a craft beer tasting and $1.00 oysters. Advanced online registration is strongly encouraged through the MOP Store. Your $10.00 per person registration fee gives you tickets to the gift drawing at the event. When you register, you are also encouraged to pre-order oysters. Pre-ordering oysters prevents lines and helps us have the right amount of oysters on hand. We look forward to seeing you at this fun and tasty event. Register here. Our friends at Big Rock Oyster company will be supplying and shucking the oysters so there should be an ample amount for all to enjoy. Mayflower Brewery with the famous MOP Photo Cutout.